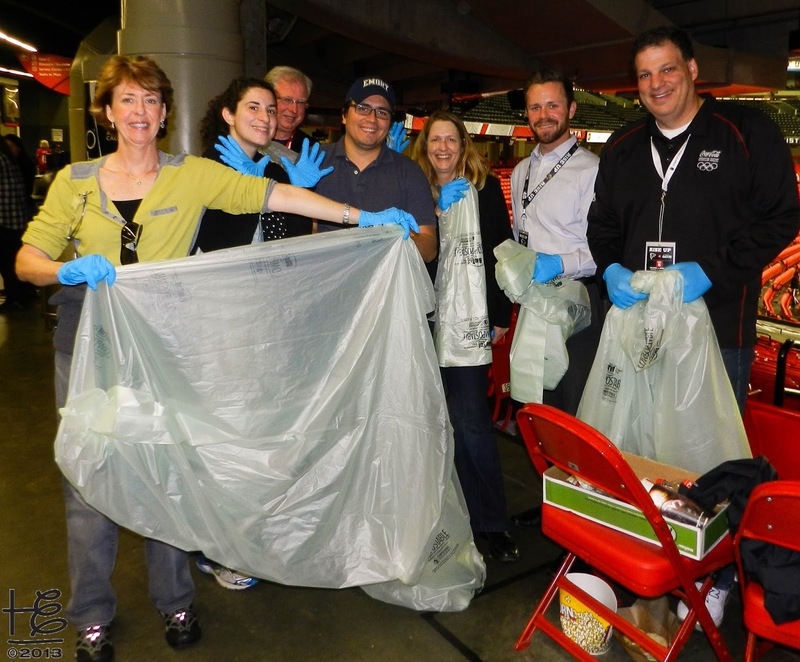 When launched in early 2009 the Zero Waste Zones (ZWZ) embarked on developing commercial back-of-the-house food waste collection for compost practices. By late 2009 the Founding ZWZ Participants issued quotes stating "this is easy, a no brainer - why wouldn't you collect food waste for compost?" One ZWZ mission accomplished! SFCI Team "picking the bowl"
In 2011 Elemental Impact launched the Sustainable Food Court Initiative to address sustainable best practices in front-of-the-house operations where the consumer is responsible for material disposition. Hartsfield-Jackson Atlanta International Airport joined as the SFCI - Airport Pilot, followed by the Georgia Dome as the SFCI - Event Venue Pilot and Concord Mills, a Simon Mall in Charlotte, NC, as the SFCI - Shopping Mall Pilot. In addition, each pilot category has its own unique challenges. 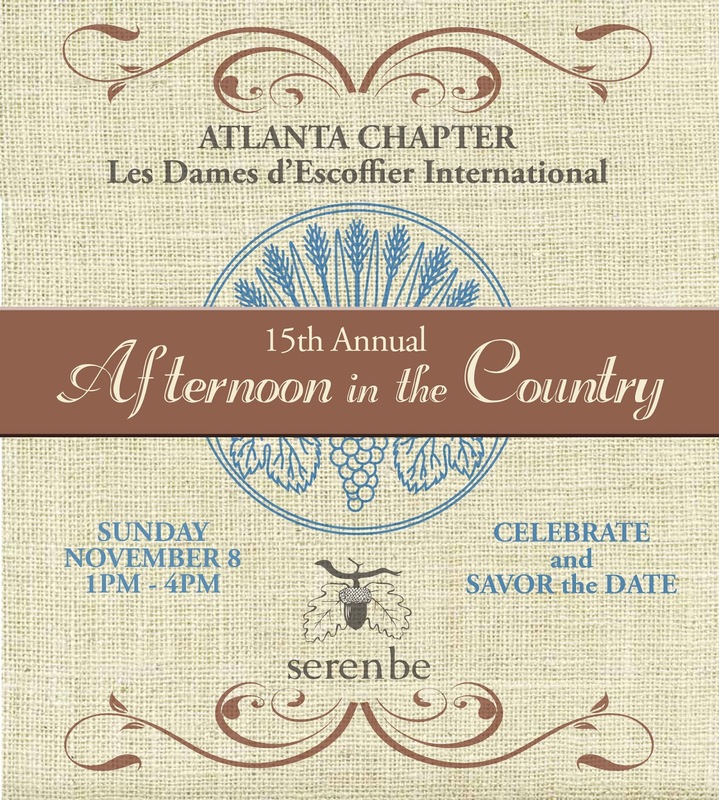 On June 15, 2015, Les Dames d’Escoffier International, Atlanta Chapter (LEDI | ATL) agreed to partner with Ei on a zero food waste journey at their prominent fundraiser Afternoon in the Country (AITC) hosted by the Inn at Serenbe within the Serenbe Community. LDEI is a worldwide society of women dedicated to creating a culture in the community that fosters excellence and promotes the achievement of women in culinary professions through educational and charitable activities. Founded in New York in 1976 by Carol Brock, a food reporter for the New York Daily News, LDEI is a membership-by-invitation, philanthropic organization that provides education, networking opportunities and scholarship support. The LDEI | ATL membership boasts nearly 100 prominent women in career paths ranging from professional chefs, restaurateurs, caterers, farmers, food retailers, event planners, cookbook authors, food journalists and historians, winemakers and wine industry professionals, food publicists, and culinary educators to hospitality executives. Known as one of Atlanta’s most unforgettable food and wine tasting events, AITC is a fund-raiser for local non-profits and scholarships for women in the culinary profession. The November 8, 2015 AITC is the event's 15th Anniversary, perfect timing to embark on formal zero food waste practices. The 2014 AITC raised over $115,000 for its beneficiaries: Georgia Organics, Wholesome Wave, Global Growers Network, The Giving Kitchen, The Wylde Center, The Atlanta Community Food Bank and Atlanta Les Dames d’Escoffier International’s scholarship fund for women in the culinary, beverage and hospitality arts. Approximately 85% of the event’s net proceeds fund the beneficiaries. 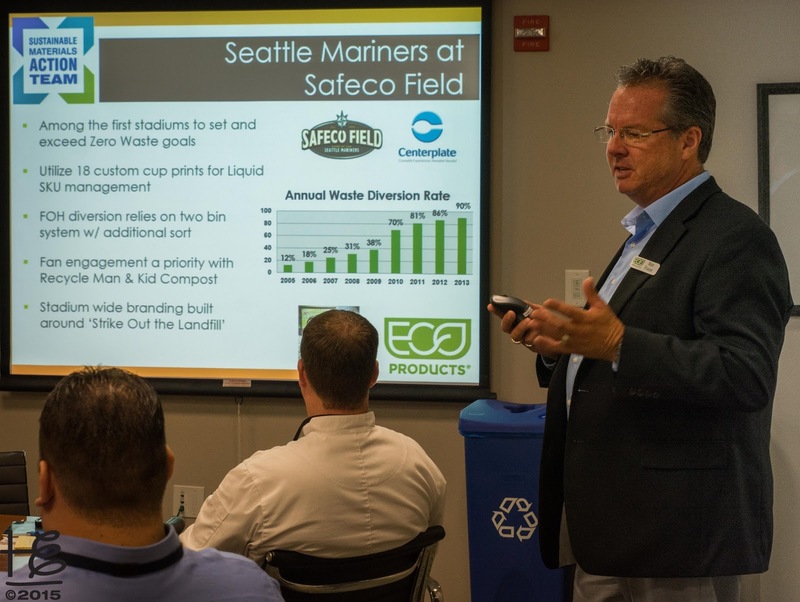 Working closely with the SFCI Co-Chair Doug Kunnemann of Natureworks & SMAT - Sustainable Material ACTION Team, LDEI | ATL is committed to creating zero food waste practices for the 2015 AITC. In future years, the practices will extend to overall zero waste practices. The intent is for the practices to segue into standard policy for all LDEI | ATL events and other annual events in the metro Atlanta area. 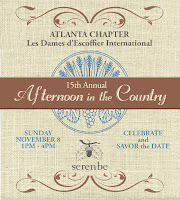 As Event Producer for Afternoon in the Country on behalf of Atlanta Les Dames d’Escoffier International and their beneficiaries, I am thrilled we now have Elemental Impact guiding us as we strive to create an extraordinary experience for our guests, raise money for great causes AND ensure that our event footprint is gentle on the earth. Ei will serve as a media partner for AITC to document and publicize the zero food waste journey, including action steps taken, challenges and successes. The 2014 Afternoon in the Country Video showcases the event flavor and importance to the culinary community and beyond. Ticket sales are open for the 2015 AITC - note the event sells out early every year! On-site Monitoring – volunteers visit foodservice operators upon arrival at event to observe f&b serving items provided by the establishment. The zero food waste plan is simple with plenty of examples to follow; instilling new practices at a 15-year old event may prove interesting at times. 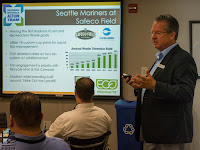 With Doug's leadership, the SMAT members will share their vast array of experience garnered from guiding stadiums, event venues and corporate offices with zero food waste practices implementation. The SMAT members include Rick Lombardo of NaturBags, Tim Goodman of NatureWorks, Sarah Martell of Innovia Films and Sarah Martinez | Ken Fraser of EcoProducts. 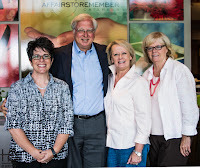 On June 15, Ei Founder Holly Elmore and Doug met with LDEI | ATL Past President & AITC Event Chair Shelley Pedersen, LDEI | ATL President Gayle Skelton and Sue Ann to discuss the potential SFCI - LDEI | ATL. It was thrilling to witness sincere enthusiasm for the industry leadership role. Most importantly, the ladies understood the far-reaching impact of AITC implementing zero food waste practices. The meeting ended with a simple, profound YES to serve as the SFCI - LDEI | ATL. Les Dames d'Escoffier International, a leader in the culinary arena, is 100% committed to organic, sustainability and enhancing the environmental condition of our Earth. Ei is the perfect partner for LDEI to take Afternoon in the Country, our largest fundraiser, to new dimensions. We are excited to serve as a trendsetter for zero food waste practices at future Atlanta festivals and beyond. With her 15 years as owner of Executive Catering & Events along with two restaurants, Holly is one of Atlanta's foodservice "old regime" and is close with many of the LDEI | ATL members. 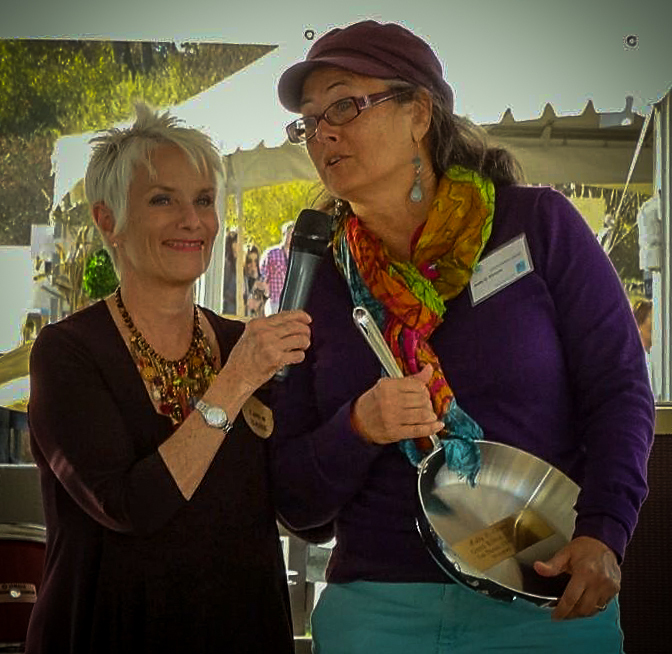 At the 2014 AITC, Holly was honored with the Green Skillet Award. The IMPACT Blog article, Ei Awards, Milestones & Recognition, features the prestigious, heart-warming honor. For a recap of Holly's long-standing, powerful foodservice industry relationships, visit The IMPACT Blog article, Annual NRA Show: fun, empowering & good for business! The key ingredient for success - teamwork - is strongly established. Next steps include crafting a detailed action plan filled with education, communication and enthusiasm. Follow future blog articles to learn how easy zero food waste is accomplished at a premier event when the recipe is followed. Recently I programmed the first round of Office activities at work. I took the process very seriously and spent a lot of time in preparing so that I can be fit as a facilitator. I'm very optimistic about the effects these corporate events San Francisco will have on my sales force.